While the dose of hot metal is only part of Stanton Sears’s Sculpture I course, “Basic Sculpture with a Dose of Hot Metal,” it’s a showstopper, and more than a little dangerous. But first, says Sears, “you have to hurry up and wait,” as the bronze slowly heats to 2,100 degrees Fahrenheit. There’s plenty to do in the meantime. The spacious two-story studio in the Janet Wallace Fine Arts Center houses a foundry, large work spaces, and a sitting area where students are eating breakfast on-the-go and scrolling through messages. Signs posted around the studio remind everyone that “If you don’t have time to clean, you don’t have time to work.” The students have just tidied up the space, putting away the hot plates, propane torches, and battered saucepans coated with wax that’s used to make replica casts of the artwork before the bronze is poured. For Sears, an associate professor of art, and a sculptor and public artist, the class is about vision. “It’s not, how do you see a portrait, but how do you see?” he says. Using physical tools, he adds, you learn things differently—learn to feel things, listen to things, and solve problems creatively. Sears runs through the details of an upcoming class field trip as the bronze continues to heat. On Sunday, he’ll drive class members down to his farm and studio in Stockholm, Wisconsin, about two hours from the Twin Cities. Students will be able to see the 14 new lambs that were recently born, have a home-made meal together, and experience a working artist’s studio. Suddenly, it’s time for the pour. 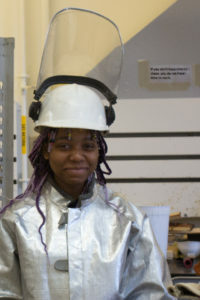 In their long silver foundry coats, gloves, hoods, and clear masks, the students are nearly identical. Everyone moves slowly and carefully, taking direction from Sears. The pot of bronze—called the crucible—is hooked to a large chain, slowly pulled up out of the furnace, and then lowered and locked into the steel pouring shank—a circle in the center of a narrow bar. Nambao and a classmate are positioned on either side of the shank with the glowing orange crucible between them. They squat, then lift, and tip the bar gracefully to pour the molten bronze from the crucible’s lip into the narrow mouth of each ceramic vessel, over and over again. They don’t spill a drop. “Good job,” says Sears. When the crucible is finally returned to the furnace, everyone claps. Then, it’s time to put away the equipment and clothing, clean up, and wait some more—this time for the bronze to cool.